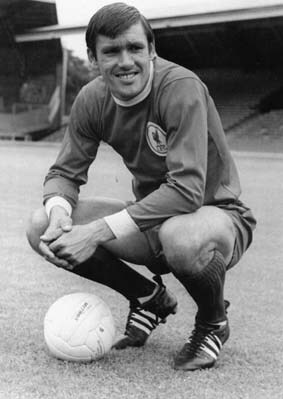 Centre-forward Tony was a 'high-profile' signing during the Summer of 1967, arriving from Chelsea for a fee of slightly under J100,000 which was an enormous sum for the time. Hateley had already scored over 150 League goals for Notts. County, Aston Villa & Chelsea when he arrived at Anfield as a 26-year-old and looked to still have the best years of his career ahead of him. He scored a hat-trick in only his 3rd League match for the Reds and missed only 4 First Division fixtures during his debut season, netting 16 times in all. He added another 7 goals as Liverpool reached the F.A. cup quarter-final stage, including four in one game as Walsall were thrashed 5-2 in a 4th round replay on Merseyside. Tony never managed to repeat the success of that first season and his career at Anfield was to be only a brief one. He was substituted at Leeds on the last day of October 1968 and was never to pull on the famous red shirt again. Shankly bought Alun Evans almost immediately and the youngster from the West Midlands took over the No. 9 shirt for the rest of the 1968-69 season. Hateley was soon sold to to Coventry City in September 1968 for J80,000. and after a spell with Birmingham City he moved back to his first club in Nottingham. Tony finished his playing career with Oldham Athletic. Tony's son, Mark Hateley inherited his dad's aerial ability and went on to play for England. The statistics of matches and goals at the top is included in the table by the conducted player of a reserve in a seasons 1968-69 not completely.